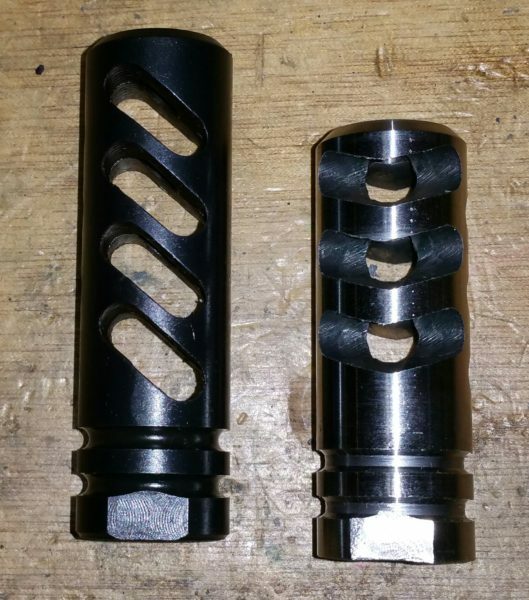 Today let’s discuss some muzzle brakes. I was buying a Phantom Style brake off of Ebay for about $16 a piece. They were nice, Nitride treated and very reasonably priced. I didn’t know or care who they were coming from, just that they were USA made. Turns out they are coming from Selous Weapon Systems, a Texas based company making all their stuff in house. They make nice stuff and they make it affordable. I’ve never understood why brakes are so expensive…I have 3/4 of a good idea what it takes to make one and could never wrap my head around why producers of them seem to think they are worth $50, $60 and well over $100. Selous Weapon Systems is making quality brakes that work at a very affordable price, if you are in the market for one, read on. The Selous Phantom style brake I was buying from Ebay. All around a good part for your build. Selous Part # D223F. This is a Shimmer Aluminum cerakote build I did for a buddy for his son. It has the SWS Phantom style brake on it, before I knew who Selous Weapon Systems was. It turned out to be a nail driver with a 69 gr SMK/Reloader 15 load I worked up for it. I’ve talked with Kreke, the Selous salesman quite a few times lately. 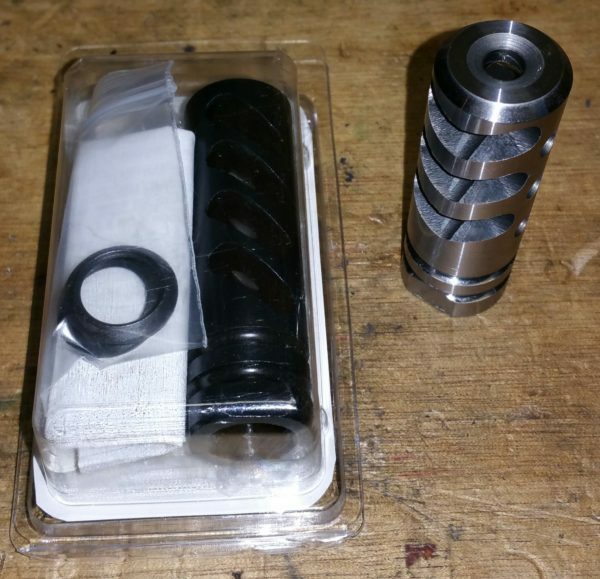 Always on the ball, informative and along with great prices the shipping has been very fast. So most importantly the customer service is there. Case in point, the team at Selous Weapon Systems read this review within an hour of it being posted. 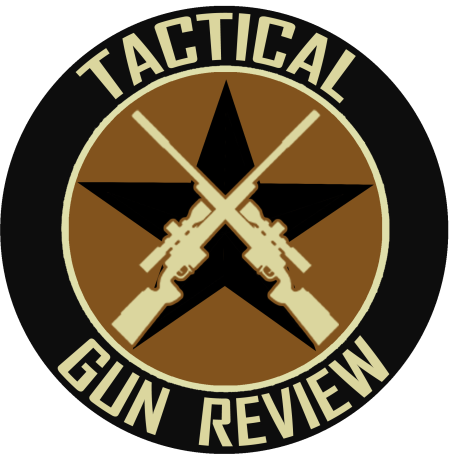 The next hour the team down there talked and what they got out of the review was they needed to add a forward directional style brake that would be better for home defense guys as far as noise for the shooter goes….if that’s not proactive and positive…I don’t know what is. Like I said customer service and then some. The email I got back within 2 hours from Selous Weapon Systems. These guys are on top of business. Selous Weapon Systems (SWS) has 5 kinds of brakes, I have used 3 of them. The Phantom style (D223F), the short competition style (D223C) and the D223A, which is the long “premier” grade SWS 223 brake. The F Phantom style on my homebuilt carbine. Brake is 2.4 ounces and 2.23 inches long. D223F: Phantom style, which I find attractive. A good all around brake for a “recreational use” build or a home defense build. The 4 ends of the thing, while not sharpened, are definitely going to cause bleeding and pain in any miscreant’s body/head you decide to smash it into. Overall it works at least as well if not better than any A2 style I have around here. For the price it’s tough to beat for a general use gun. The C model short comp on my 10.5 inch homebuild. 3.5 ounces and 2.39 inches long. D223C: This one is the silver one in the pictures, it is in the white and will need me to cerakote it when I decide where it goes. Yours will come Nitride finished. Nitride is the way to go as far as I am concerned. The brake looks great on a weapon, it cuts recoil and muzzle rise substantially over the directional brake I had on the test weapon. This is a brake the competition shooter will like at a price that’s not 9 billion dollars. You will get some wind back in your face as the ports are slanted back towards the shooter. I did not find this to bother me, no particles or hot stuff, just like “wind” or concussion. This brake is LOUD!! Home defense gun guys forget this one. You will be sorry you touched it off in your house especially, but ANY time your ears are not muffed. Competition shooters will like the muzzle barely moves. Left is the A model, right is the C model in the white. The C is the LOUD one. My 12.5 sporting the D223A model. Zero muzzle movement, very nice. It’s working well with a DoubleStar adjustable gas block I used on that build. Brake is 4 ounces and 2.835 inches long. D223A: SWS calls this their premier brake. It is very nice, laser etched with their logo and priced to sell. It is similar I guess to the C model. Just longer and the side ports vent straight out, not back at the shooter. They both have the same round holes which need to be timed to 12 o’clock when you install. I used this brake for 2 mags and handed the 12.5 shorty over to another shooter to watch the muzzle for myself. It just didn’t move. Fast double and triple taps, no problem. Again great for competition guys without breaking the bank. This brake is a little on the loud side, I’m used to forward directional brakes. So I did notice the noise increase to the shooter. 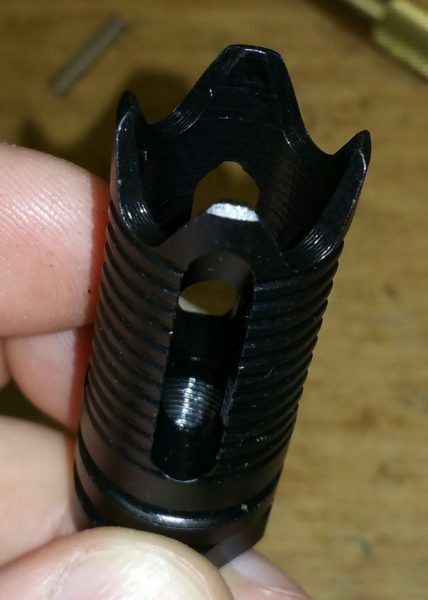 I’d still recommend that HD guys stay away but guys shooting with ears on and trying to do so quickly are going to like this, VERY effective on recoil and muzzle rise. 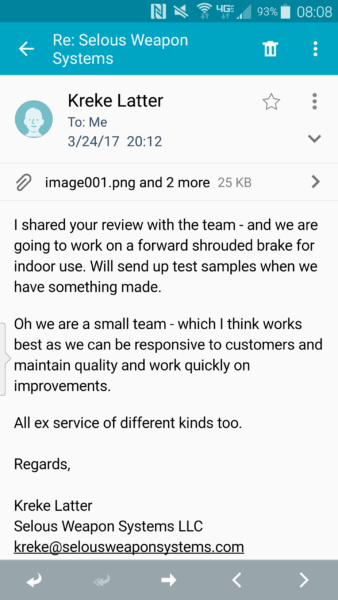 Summary: I like their brakes. I like the fact you won’t go broke even more. Good, solid, American made products at fair prices. They make upper receivers too, so look for a review of those coming soon. I have used 5 so far. Kreke at Selous Weapon Systems has dealer breaks, bulk breaks and just generally good fair prices for the guy buying 1 piece. Get ahold of these guys at http://selousweaponsystems.com to view the website or email Kreke Latter at kreke@selousweaponsystems.com and tell him Cary from TGR sent you. He’ll take care of you whether you buy 1 or 10,000 pieces. As always thanks for reading and train often. D223A still in package, the D223C shown in the white.